We love seafood. Hubby and I would often buy fresh seafood and cook them at home. 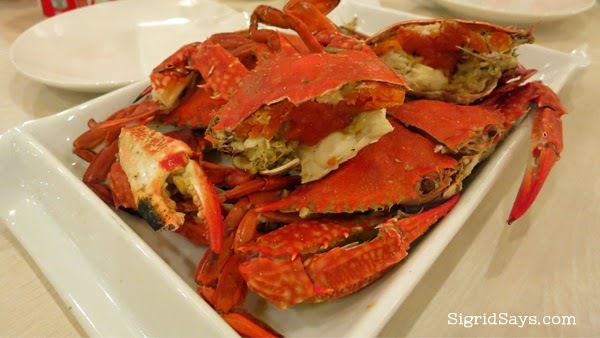 But when we dine out, we also love to seek out Bacolod seafood restaurants. 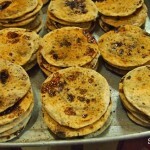 I also include some joints here that serve native dishes. They’re kinda related anyway. 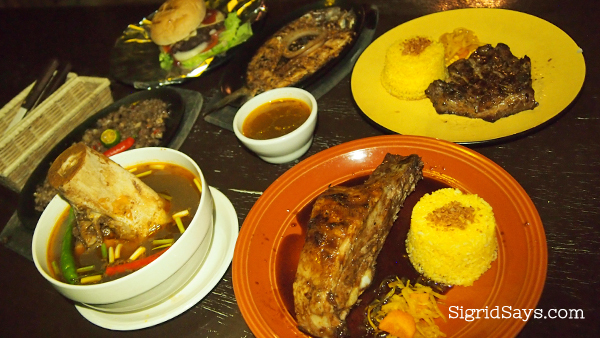 For a complete list of homegrown Bacolod restaurants, read my other post. Several Bacolod seafood restaurants have opened based on the Pala-pala practice, such as Hyksos Pala-pala. They have branches at the Pala-pala area and across SM City Bacolod north wing (the street is actually called Burgos Extension). Our spread at Hyksos Pala-pala, from left: calamares, sizzling manumbok, more calamares, and buttered garlic shrimps. Diotay’s Eatery serves seafood and other native Filipino foods. They have an air conditioned area for small functions, which also open to those who just want to dine in an air conditioned space. Located at Gatuslo Street, Bacolod City, just after the back of the old Provincial Administration Center. Open daily for lunch and dinner. 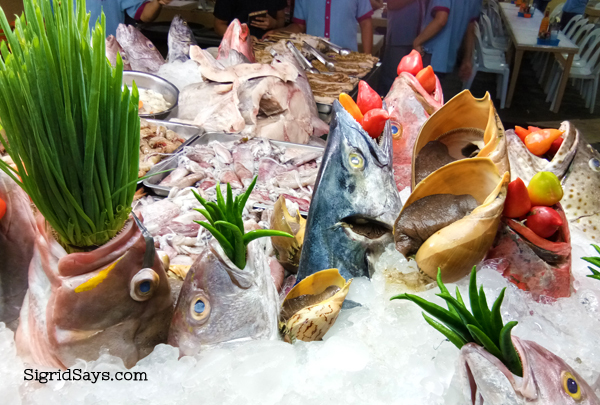 Fresh seafood on display at Diotay’s Eatery. Located at Gatuslao Street, Bacolod City. The Viewing Deck in Pta. Taytay is a string of “floating” Bacolod restaurants or eateries near the beach at Pta. Tay Tay. They serve the freshest catch of the day. 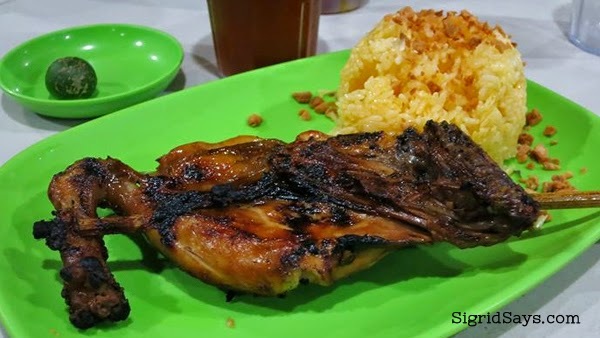 There are 18 native Bacolod restaurants there–none of them air conditioned. We only tried the Viewing Deck No. 8. Lion’s Park Grill Haus is the first restaurant on the right side going inside Manokan Country. 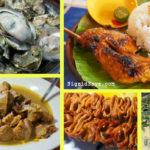 They have great Bacolod chicken inasal, talaba “oysters”, and a turo-turo food counter of Pinoy favorites. They also have a branch at Hi-Strip 2 East Block, Villa Angela, NGC. Bacolod chicken inasal and oysters at Lion’s Park Grill Haus. Masskara Chicken Inasal is SE-Optimized. 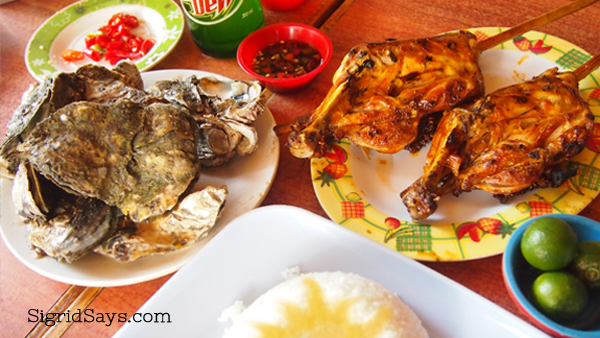 Two words that speak of Bacolod–MassKara and Chicken Inasal. 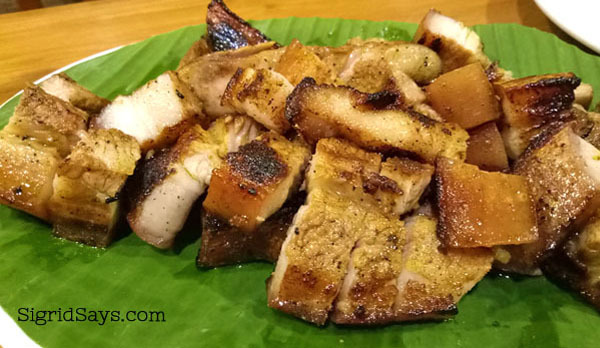 They serve Bacolod chicken inasal, sizzling squid, sisig, and all-time Pinoy favorites. They have an air-conditioned room for small parties. Open for lunch and dinner daily. Located at corner Narra Ave.-BS Aquino Drive. They have ample parking space. Super Batchoy House is one of the best batchoy houses in Bacolod. They are open daily from brunch to dinnertime. Visit them at their branches at Locsin Street, Cuadra Street, Villa Angela East Block, and near Lopue’s San Sebastian. 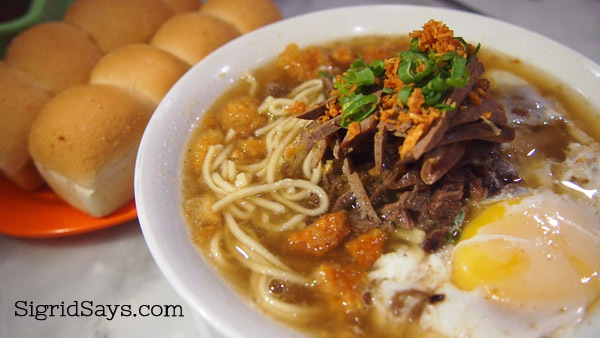 Special batchoy at Super Batchoy House with egg served with pan de siosa on the side–a long-time Ilonggo favorite. Ading’s Pala-pala is the improved version of the pala-pala practice in Bacolod. They have this big, air conditioned Bacolod restaurant across the market that can accommodate up to 300 people. Visit them at the Old Pala-pala area. Open daily for lunch and dinner only. Tel. No. (034) 458-1594. Steamed alimango at Ading’s Pala-pala. Quan Native Delicacies serves Pinoy delicaies like puto, cuchinta, pitsi-pitsi, ibus, sapin-sapin, suman, suman latik, among others. They also have cakes, breads, and Bacolod pasalubong. Their bestseller for snacks is the dinuguan and puto combo. Biggest branches are at La Salle Ave., North Drive, Lopue’s East, and Gaisano City. 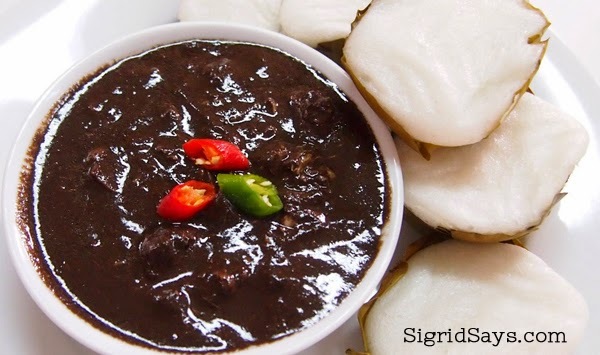 Perfect together–dinuguan and puto at Quan Native Delicacies. Available daily. 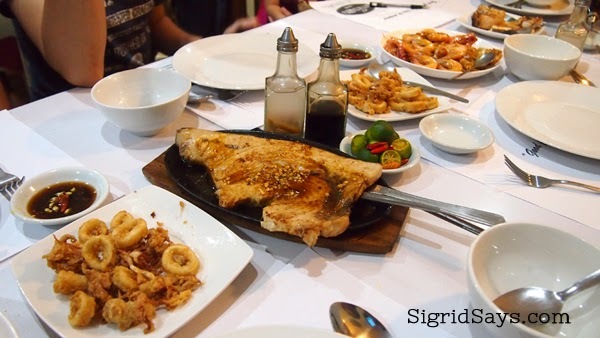 Enting’s of Sagay is among the famous Bacolod restaurants serving seafood. Located at the Villa Angela Marketplace beside the New Government Center, they serve their brand of fresh seafood dishes. Open daily. Don’t miss their different kinds of kinilaw. Rodrigo’s Cansi House at Hilado-Tindalo Streets, Shopping, Bacolod City is more than just a cansihan. They serve Pinoy favorites that are really good and affordable. They have a spacious non-aircon restaurant, an open-air dining area, and an air conditioned function room. Open daily for lunch and dinner (cept Sundays), 11am to 2pm and 5pm to 10pm. Rodrigo’s Cansi House. 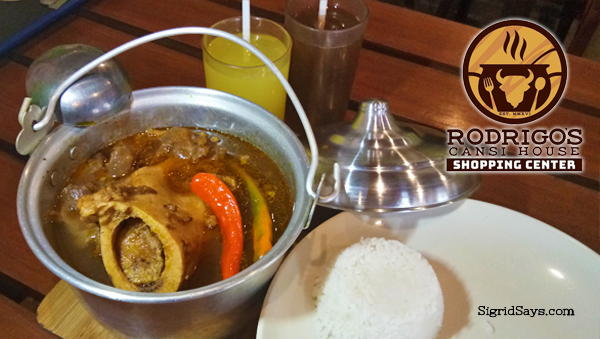 Their specialty is Cansi Lawas (pictured above), only P160. If you want unli-rice and a round of drinks, its P185. Ilonggos love nilagang baka (or beef soup) called cansi. 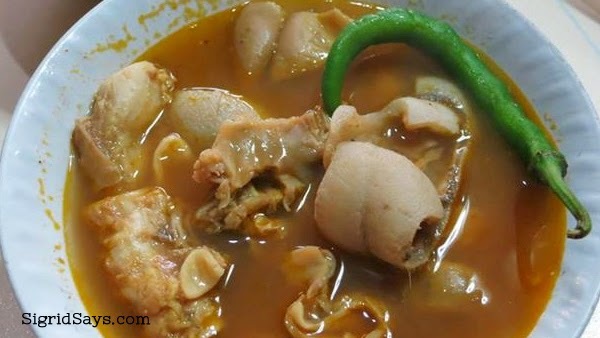 A famous Bacolod restaurant is Sharyn’s Cansi House at Narra Avenue, Shopping, Bacolod City. The place is not air-conditioned. 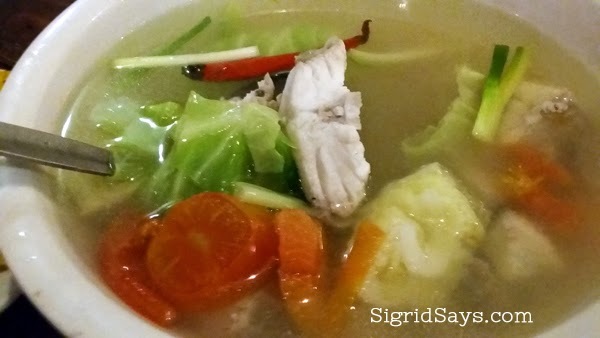 Sharyn’s Cansi House Silay also serves the same Bacolod cansi soup. Located at the national highway, Silay City. Open daily, from 7am to 10pm daily. Bone marrow and cartilage of this cansi serving rebel against the small bowl that it was forced into. This is my husband’s bowl at home, as we bought our Sharyn’s cansi for take out. Owa’s Pangahan is not in Bacolod but in Silay City, located near the Bacolod-Silay Airport. They serve unique dishes using the tuna panga (jaw). Located at Mana-ul St., Silay City, at the ancestral home of the Estrellas of Silay. Try their different kinds of fried rice. Tel. No. (034) 476 7220. A single serving of grilled tuna panga with peanut sauce at Owa’s Pangahan. On the Galo Street side of La Consolacion College Bacolod, you will find a string of rugged Bacolod restaurants that sell pork barbecue. They are collectively known as “LCC pork barbecue”. 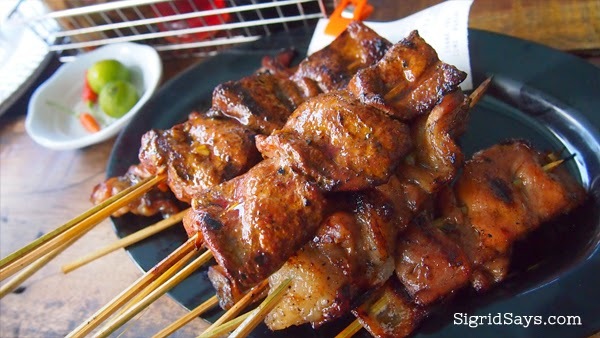 They serve some of the best and cheapest pork barbecues in Bacolod. I like eating at Bacolod Bakerite. LCC pork barbecue fresh from the grill at Bacolod Bakerite. Nena’s Rose II has a stall at Manokan Country. They have branched out at Narra Avenue extension, which is a much bigger place. Steamed oysters also available. Open for lunch and dinner. Tel. No. (034) 4321434. The classic paa (leg) with garlic rice made yellow by achuete oil. Imay’s is the longest-serving among the Bacolod restaurants along 6th Street, Bacolod City. 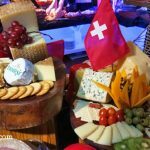 They serve native foods like sinigang, crispy pata, pork sisig, kare-kare, stuffed squid, scallops, and other yummy vegetables dishes like the Spicy Porbidang Kangkong. Open daily for lunch and dinner. 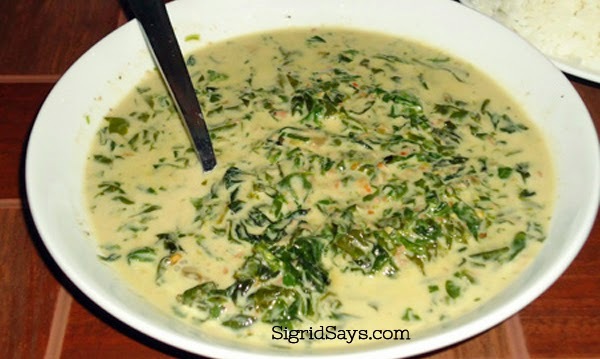 Spicy Porbidang Kangkong at Imay’s Restaurant. It can both be an appetizer or a viand. Zharnss Grill is a 24-hour non aircon eatery at Goldenfield Commercial Complex, Singcang. They are located on the road leading to Magsaysay Avenue. They serve hot and flavorful Pinoy meals 24 hours a day, like Soup No. 5. Cash only. 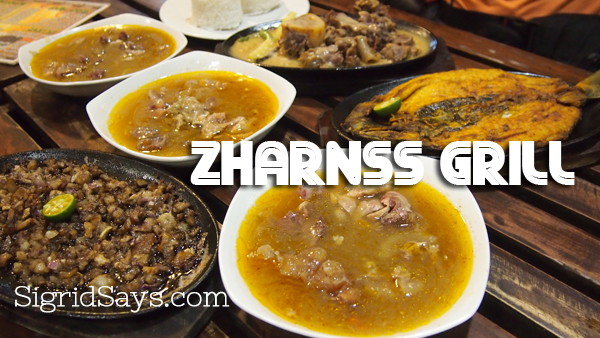 Big servings of hot meals at Zharnss Grill available 24 hours a day, from left, sizzling pork sisig, Soup No. 5, sizzling cansi, and boneless bangus. 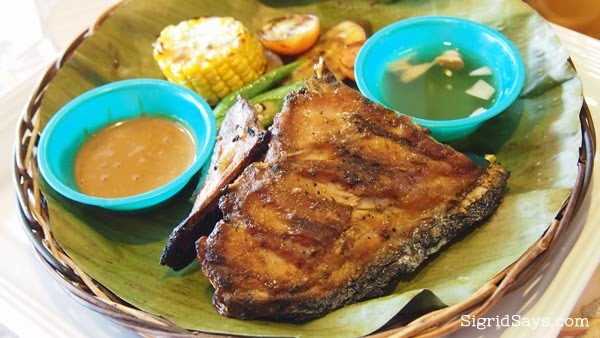 Bacolod has taken to a liking for grilled baby back ribs with sweet barbecue sauce. 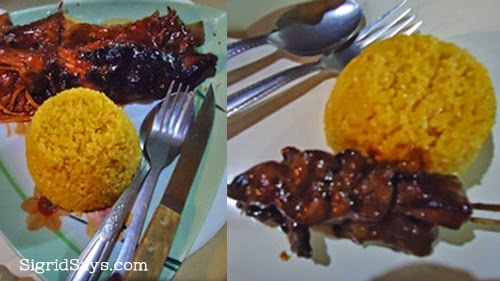 Leading the series of Bacolod restaurants with baby back ribs is Lord Byron’s Backribs. They are now located behind Luxur Place, Magsaysay Avenue and at San Agustin Drive, Bacolod City. 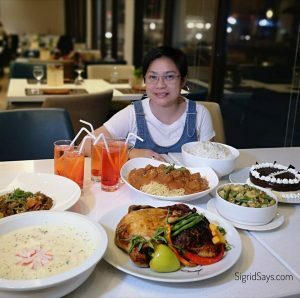 The six main dishes served at Lord Byron’s Backribs–Baby Back Ribs, Spareribs in Wine Sauce, Sizzling Boneless Bangus, Cheeseburger, Kansi soup, and Sizzling Pork Sisig. 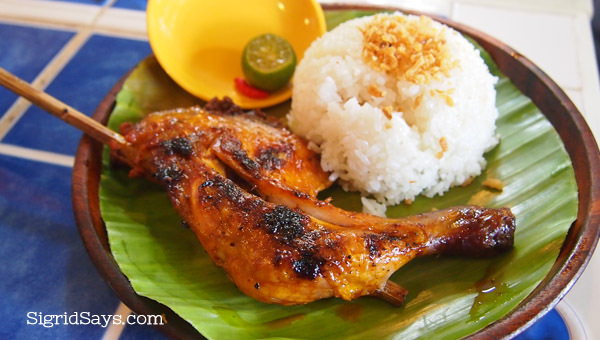 Chicken House is a Bacolod chicken inasal place in a much nicer setting. Considered one of the established Bacolod restaurants, they have an air conditioned area and decent restrooms, too.They have branches at Araneta-Singcang, 23rd-Lacson, and Hilado St.
18th St Pala-pala is a nice Bacolod restaurant that carries the word “pala-pala” in its name. You can order from their assortment of delicious Pinoy favorites on the ala carte menu and their turo-turo (fastfood) counter. Open daily for lunch and dinner. Tel. No. (034) 433 9153. Located at 18th-Aguinaldo Streets, Bacolod City. 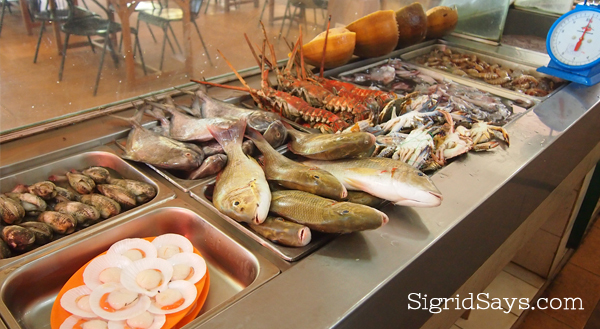 Fresh seafood at the 18th Street Palapala. 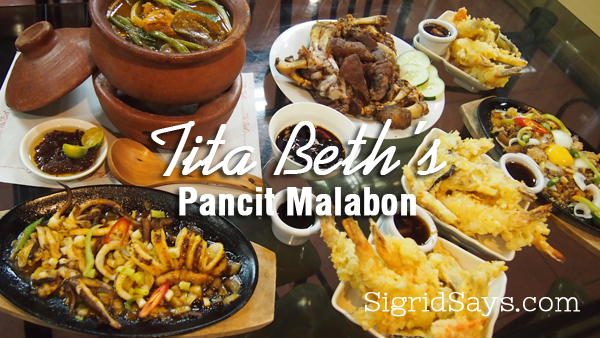 Tita Beth’s Pancit Malabon Haus specializes in pancit malabon and other Pinoy native dishes like crispy pata, sizzling sisig, sizzling squid, chicken inasal, kare-kare, and kakanin. They have pork barbecue and nilagang pata. Open dining area and aircon room available. Located at 27th-Lacson Street, Mandalagan, Bacolod City. Open from 10am to 10pm daily. A delicious spread that we had at Tita Beth’s Pancit Malabon with a sampling of some of her many yummy yet affordable dishes. 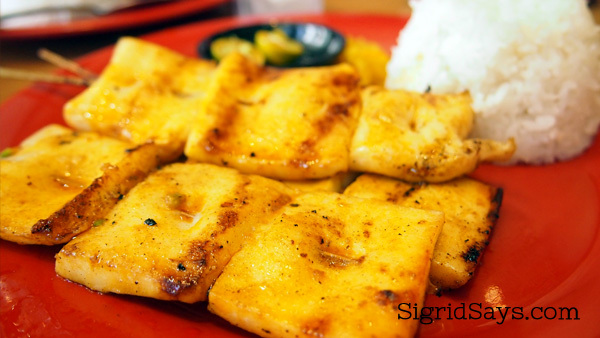 Ribshack is a homegrown Bacolod restaurant that specializes in budget-friendly grilled meats and seafood. Their baby back ribs, spareribs, blue marlin, jumbo squid, beef kebabs, and grilled chicken are awesome. Open daily during mall hours, located at the south wing of SM City Bacolod (in front of Ace Hardware), at the District North Point (Ayala), and Food Court of 888 Premier Mall. Three skewers of sliced jumbo squid with rice at Ribshack. 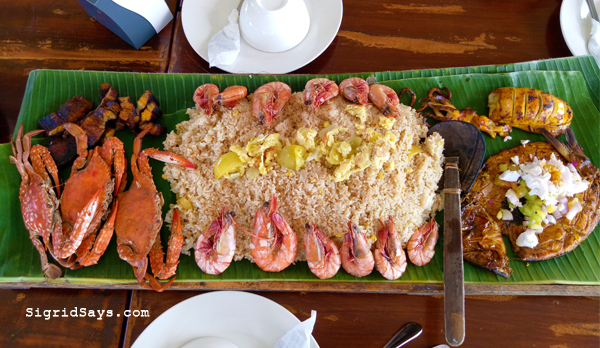 Palawud Resto Grill serves seafood and native dishes, but the most popular are the “boodle” meals, where different foods with rice are laid out on a banana leaf. Located in San Juan Street, Banago, Bacolod City. It’s a big open restaurant and they have live entertainment during weekends. Tel. No. (034) 441 6506. A sample of a boodle meal at Palawud Resto Grill. Jay-J’s Filipino Cuisine a Bacolod restaurant serving Filipino dishes. 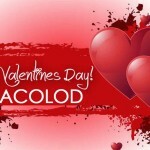 We love their jumbo boneless bangus, kare-kare, crispy dinuguan, fried chicken, crispy pata, and vegetable dishes. Located at the Art District, Lacson St., Mandalagan, Bacolod City. Open for lunch and dinner. 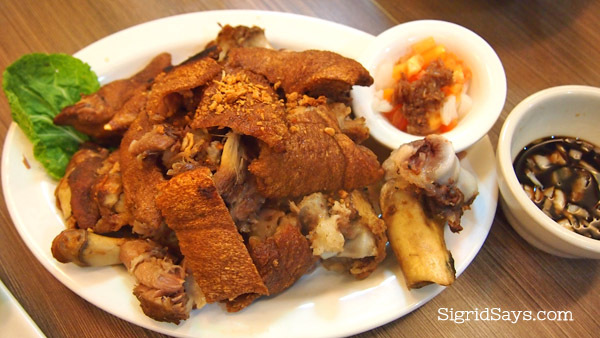 Crispy pata and its condiments at Jay-J’s Filipino Cuisine. This is a two-storey Bacolod restaurant with an open area for garden functions. They serve all-time Pinoy favorites ala carte and turo-turo dishes and seafood cooked pala-pala style. They close on Sundays. Aboy’s Restaurant is located at Goldenfield Commercial Complex. Tel. No. (034) 435 0760. Charcoal-grilled pork at Aboy’s Restaurant. Pamilya Grill is located at Margarita St., Eroreco Subd., Bacolod City, on the way to Our Lady of Mercy Hospital. They serve affordable all-time favorite meals like baby back ribs, sate babi, boneless bangus, sizzling sisig, pork barbecue, and Mongolian rice. Tel. No.433-7184 or 0939-1275793. Left, baby back ribs and right, sate babi. Both are served with sate rice at Pamilya Grill. These are not Bacolod restaurants but a row of eateries along B.S. Aquino Drive corner Narra Avenue, Capitol Shopping Center, Bacolod City. However, you will notice them because of the large metal pots on top of charcoal stoves that are visible from across the street. They keep the soups boiling all day so that they can serve them piping hot. 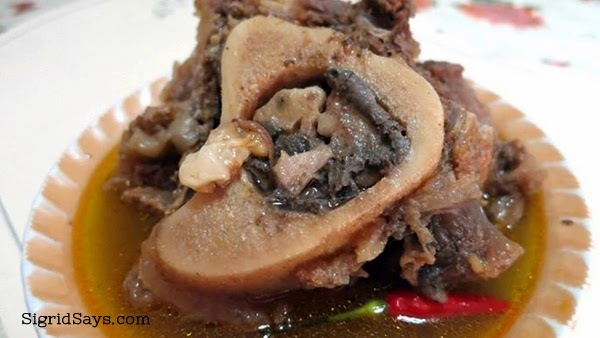 You will find an assortment of beef and cow innards nilaga. A soup made of different innards of a cow, made sour with batwan and spiced up with papaitan chili. The soup is colored with achuete. Pala-pala refers to the line of eateries along the Pala-pala seafood market. However, some of these Bacolod seafood restaurants are makeshift. 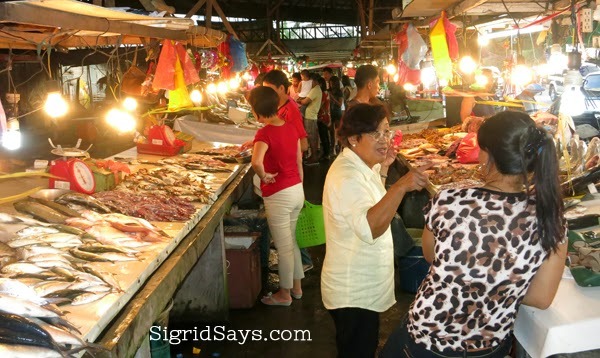 The usual practice is that people buy fresh catch at the seafood market then they go to these eateries called “tulahan” (an Ilonggo word that means “where tinola is cooked”). 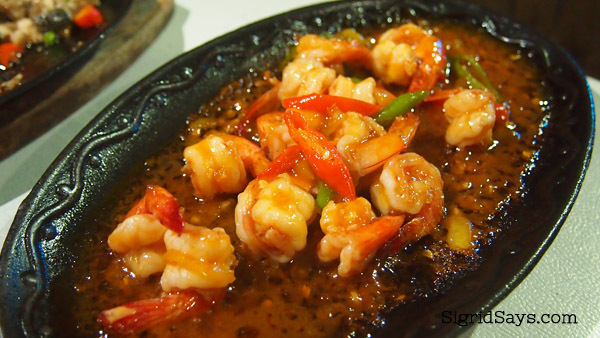 They cook your seafood according to your liking–grilled, buttered, sizzling, fried, or as tinola (in a soup).